You can edit any time entry you’ve made directly in your timesheet on the Timer Tracker page. To change the description, simply click on it and type what you want. All changes are automatically saved. You also select or change projects, billability, tags, start and end times, date, and duration, by clicking what you want to change, and typing the new value. The person who has created the time entry can edit it any time he or she wants. Admins can edit all time entries (in Detailed report), regardless of who created them. If you want to delete a time entry, click on the three dots on the far right side of the time entry you want to delete, select Delete, and confirm. If you started a timer by accident, you can click X to cancel the timer. You can also bulk edit your time entries on the Time tracker page when you click the little edit icon near the total number of hours you tracked that day. Bulk edit will then be enabled for that specific day. Admins can edit all time entries in the Detailed report. There, you can filter all time entries by whatever criteria you need, and directly edit the results. When you’re cleansing data and want to fix incomplete time entries (like entries that have no description, no associated project, or are missing a tag). If you tracked more billable time than needed and want to “forgive“ some time entries, and mark them as non-billable. 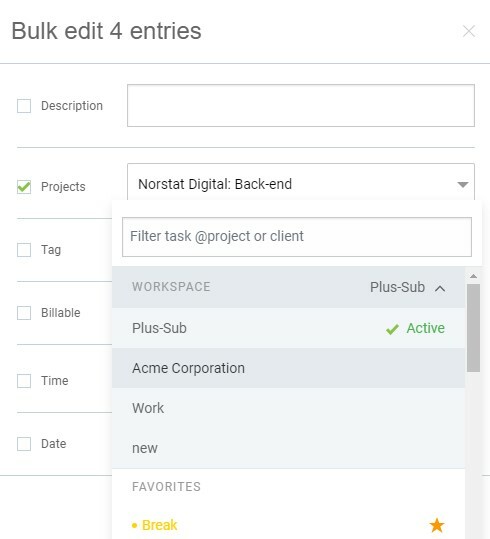 To move entries to another workspace use the bulk edit feature on the Time Tracker page. Expand the Workspace list and select a Workspace and a project in that workspace were you want your entries moved. Assigning all time entries to a project located in another workspace will automatically transfer the data to that other workspace.